JOHN S. AHERN and ALICE M. AHERN vs. DUNES BEACH ASSOCIATES, INC., DONALD J. HARRAHY, DORIS A. HARRAHY, CLIFFORD R. BREWER, EMMA C. BREWER, CHARLES W. BEATTIE, ELIZABETH J. BEATTIE, WILLIAM C. McGOVERN, JOY W. McGOVERN, MICHAEL J. MERTEN, FRED HEDLUND, JR., BARBARA A. HEDLUND, EDWARD F. SAVAGE, EVELYN V. SAVAGE, FRANK X. MANGANARO, NANNETTE S. MANGANARO, DONALD B. LAKE, MARY M. LAKE, EDWARD E. ANDREWS, ANN-MARIE K. ANDREWS, ROBERT W. CHESNEY, TERRY TESTER, A. JOSEPH LASKOWSKI, VIRGINIA M. LASKOWSKI, DANIEL H. DeMALE, VIDA R. DeMALE, and TOWN OF EASTHAM. ORDER DENYING PLAINTIFFS' MOTIONS FOR SUMMARY JUDGMENT AND GRANTING DEFENDANTS' MOTIONS FOR SUMMARY JUDGMENT. 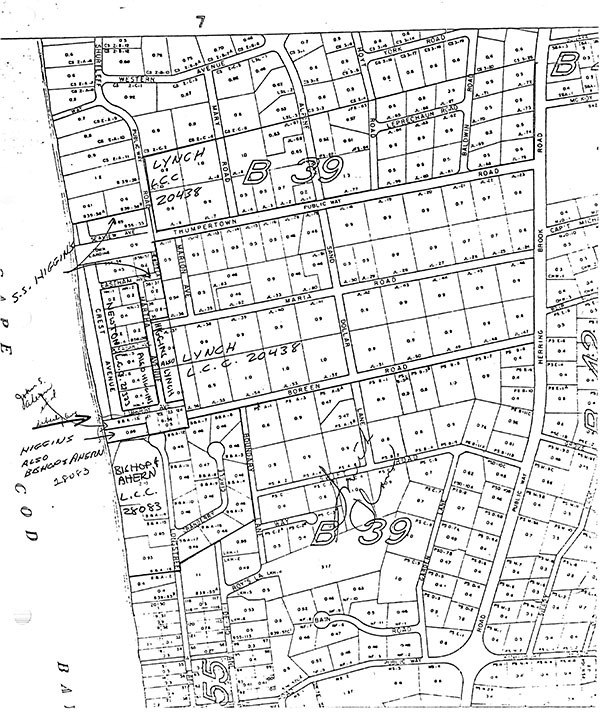 The plaintiffs are the owners of lots 19 and 20 on a plan entitled "Plan of House Lots for S. S. Higgins, Eastham, Mass.," dated June 20, 1899 and recorded with Barnstable Deeds, Plan Book 26, Page 127 (the "Higgins Plan"). Title to a portion of lots 19 and 20 was registered in Case No. 28083, but title to the remainder, closer to the site of the present dispute, remains unregistered. The plaintiffs in the present proceeding seek diverse avenues of relief against the Town of Eastham (the ''Town") added as a necessary party defendant by order of Court entered on December 18, 1981, and against Dunes Beach Associates, Inc. and twenty-six property owners in said town. Motions for summary judgment by the plaintiffs and the original defendants were argued on December 6, 1981. After the Town was made a party and answered, motions by and against it for summary judgment again were argued on June 1, 1982. Affidavits were filed in connection with the motions, and upon motion by counsel for the private defendants, the Court also has considered its records in Registration Case Nos. 27333 and 28083. For the sake of clarity, the Court has attached to this decision a copy of the Eastham Assessors' plan on which counsel for the private defendants has indicated the location of the plans which figure in this proceeding and the numbers of the relevant Land Court cases. The Court suggested to counsel at the hearing on June 1, 1982 that motions for summary judgment were an inappropriate method of deciding the complex issues presented in the complaint, but the argument was made that there were no facts in dispute. After consideration of the pleadings, the affidavits and the records in the above-numbered Land Court cases and other cases in the same area (Registration Cases Nos. 38549, 38550 and 38551) the Court denies the plaintiffs' motions for summary judgment and grants the defendants' motions for summary judgment. 1. The Higgins Plan depicted sixty numbered lots and seven streets, i.e. Liberty Avenue, Pleasant Avenue, Eastham Avenue, Seaview Avenue, Hewett Lane, Martha Avenue and Crest Avenue. 2. In Land Court Case No. 20438 title to fifty-seven numbered lots were registered, the majority to the original petitioner, James E. Lynch, and the remainder to parties claiming under him. A portion of lots 37 and 56 on Land Court Plan No. 20438A (the ''Lynch Plan") also are shown on the Higgins Plan, i.e. lots 25, 26, 29, 30, 31, 32, and part of 33. 3. Martha Avenue, as well as Liberty and Eastham Avenues and Hewett Lane, also are shown on the Lynch Plan. "2. That each of the parties and all other persons owning property in the S.S. Higgins subdivision as shown on that plan, legally entitled thereto, have the right to use said ways, on said plan, in common with the petitioner and other persons having a legal right over said ways." ''The land hereby registered is subject to, and has the benefit of, the terms of a stipulation between the petitioner and Mildred Schofield, filed with the papers in this case on August 9, 1948, a copy of which will be filed at the Barnstable County Registry of Deeds with this decree." The decrees in the names of substituted petitioners who had acquired title to lots from Lynch during the pendency of his registration proceedings did not mention the stipulation. 5. Thereafter, Harvey C. Newton and wife registered title to all the land on the Higgins Plan between Eastham Avenue on the north, Martha Avenue on the east, Liberty Avenue on the south and Crest Avenue on the west, other than lots 53 and 54 which subsequently were registered in the name of a third party in Case No. 38551. In the Newton registration proceedings a stipulation was entered into between the petitioners and the Town of Eastham to the effect that firstly, the petitioners waived and relinquished any claims of ownership they have or might have in Crest Avenue, and to the premises lying between said Crest Avenue and the waters of Cape Cod Bay, and that secondly, the petitioners, in common with the public, The Inhabitants of the Town of Eastham and all persons deriving said right by ownership of lots shown on the Higgins plan, had the right to the use of said Crest Avenue and the premises between it and the waters of Cape Cod Bay for the purposes of travel on foot or by vehicle and for bathing, boating, fishing and kindred purposes, subject only to such rules and regulations as may now be in force and effect or may from time to time be set up or enacted by the Town. "There is appurtenant to the land hereby registered rights in and over said Crest Avenue and the area between said Crest Avenue and Cape Cod Bay, shown on said plan, subject only to such rules and regulations, all as set forth in a stipulation between the petitioners and the Inhabitants of the Town of Eastham, filed with the papers in this case on October 21, 1958 . . ."
7. In the Case No. 27333 registration proceedings, the plaintiffs' predecessor in title, Harry Taylor, filed an answer. 8. There is a third subdivision plan of relevance which is entitled ''Subdivision of Land in Eastham, Mass. belonging to Philip M. Smith", dated December 1952, by Scofield Brothers, duly recorded (the "Smith plan"). 9. Dunes Beach Associates, Inc. ("Dunes") is a Massachusetts corporation organized under General Laws, c. 180, for the purpose of a neighborhood improvement association, has a membership of thirty-seven families and presently is accepting no new members. 10. Dunes is said to be the grantee in an instrument granting an easement five feet in width for the purpose of a footpath to be used by its members and extending westerly along Boreen Road on its southerly side adjacent to land now or formerly of Leroy K. Houghton to the westerly terminus of said road, then turning at a right angle and extending northerly across Boreen Road and over Lot 56 along its southwesterly boundary a sufficient distance to provide footpath access to Liberty Avenue. 11. Dunes, through its members, has constructed and is continuing to maintain a set of stairs on the banking at the edge of Cape Cod Bay leading down from Crest Avenue to the beach at a point at least seventy-five feet northerly of Crest Avenue. 12. Since 1979 some of the individual defendants have walked westerly on the northerly side of Liberty Avenue to Crest Avenue, and thence northerly on Crest Avenue to the stairs and descended them to the beach with a reverse route being followed on their return to their properties. Prior to 1979 and the commencement of construction of a house on lot 7 on plan No. 27333A the neighborhood route to the beach crossed said lot. 13. The defendants Laskowski are the owners of the land with the dwelling thereon on the southerly side of Boreen Road, shown as Lots 1 and 3A, Block B on the Smith plan. The dwellings are rented during the summer months with the maximum number of occupants limited to twenty-two persons. 14. The defendants DeMale are the owners of land on the northerly side of Sand Pit Road (now Weir Road) shown on the Smith plan, but said land is not part of the subdivision shown thereon. The plaintiffs seek a permanent injunction restraining a) each of the individual defendants from using Liberty Avenue as shown on the Higgins plan for access to Cape Cod Bay and b) Dunes and its members from constructing, repairing, maintaining or providing an access route or stairway to Cape Cod Bay which requires the use of the ways on the Higgins plan, particularly Liberty Avenue. The plaintiffs further seek a determination that the defendants Manganaro and Harrahy as owners of Lots 37 and 56 on the Lynch plan and those claiming under them may not use Liberty Avenue to reach Cape Cod Bay, and a further determination that the stipulation in Case No. 20438 registered as Document No. 33426 gives none of the defendants whose certificates of title refer thereto any right to use Liberty Avenue. The plaintiffs also seek relief against the Town of Eastham by a determination that a) it has no prescriptive right to use Crest Avenue and the land between Crest Avenue and Cape Cod Bay for the purpose of boating, bathing, fishing and other like purposes, b) that the Town took only such rights as Harvey C. Newton and wife might have in the area covered by the stipulation in Land Court case No. 27333 and that rights acquired by the Town under said stipulation are not in derogation of the rights of the plaintiffs and other owners of land on the Higgins Plan. The abstract in said Registration Case No. 27333 commences with a deed from Martha C. Higgins to Solomon S. Higgins, dated November 19, 1897 and duly recorded in Book 235, Page 24, which bounds "by the bay" (s. 2) but the Higgins plan does not show any land lying westerly of the most westerly line of lots thereon other than so much thereof as is shown as Crest Avenue. In conveying out lots the pattern seems to have been to describe the property by lot number. By virtue of the dangling fee statute, G. L. c. 183, §58, such a conveyance today would be construed as including the entire fee of Crest Avenue subject to the rights of others entitled to use it. The beach area which exists in fact on the ground although not shown on said plan arguably might have been considered either an amenity appurtenant to land of the owners of all the subdivision lots or an area retained by the developer or one in which a third party has obtained rights by adverse possession or otherwise. The adoption by the Court in the decree of registration of the stipulation in Registration Case No. 27333 forecloses the plaintiffs from now raising any question as to the rights of the public and the Town in Crest Avenue and to the title to the land between it and Cape Cod Bay. It is the plain import of the decree that title to the fee of Crest Avenue and the beach is in the Town as provided in the stipulation. Notice of the proceedings had been given to the plaintiffs' predecessor in title (who appeared and answered). This question could have been litigated at that time and was not. It is now too late to object to the Court's acceptance of the position of the Town of Eastham incorporated in the stipulation. By the stipulation the petitioners in Case No. 27333 relinquished any claim of ownership to the fee of Crest Avenue and to the land between it and the waters of Cape Cod Bay subject to their rights to use the same in common with the public, The Inhabitants of the Town of Eastham and all persons deriving said right by ownership of lots shown on the Higgins Plan, for the purposes enumerated in the stipulation. Therefore, the defendants in this case as residents of Eastham and members of the public, have a right to use Crest Avenue and the beach. The plaintiffs, as owners of lots on the Higgins Plan, may have standing to question the extent of the use by the defendants in their erection of stairs to reach the beach even if the town, the owner of the fee, does not. The primary right to contest the erection of the stairs, however, would appear to be in the Town. In any event, one who has the benefit of an easement has the right to employ all necessary means to enjoy it fully, and the erection of stairs is permissible under this principle. See Sullivan v. Donohoe, 287 Mass. 265 , 267 (1934). The decree in registration Case No. 27333 included the appurtenant right to use Crest Avenue and the area between the street and the waters of Cape Cod Bay. The Court, therefore, accepted the position of the parties that title to the fee in the street and the beach was in the Town of Eastham. If the status of the Town's title now were open to challenge, it appears that the Town would be able to show title based either upon tax takings or adverse possession. Daley v. Swampscott, Mass. App. Ct. (1981). [Note 1] The Town, therefore, as the owner of the beach, would be the more appropriate party to raise any question as to the propriety of the defendants' use of the beach. The motion for summary judgment by the Town accordingly is allowed. ''There is no evidence that the plaintiff Dow has placed any undue burden on the easements, despite the fact that he lives in a house on a parcel adjacent to the narrow parcel to which the easements created by the Whittington deeds are appurtenant. Compare Brassard v. Flynn, 352 Mass. 185 , 189-190 (1967). It will be time enough to consider whether he in fact overburdens the easement when and if he makes a more significant or any unreasonable use of the beach rights or of the extension of Bradford Road." The only remaining issue concerns the right of the remaining defendants, principally owners of lots on the Smith plan, to use Liberty Avenue to reach Crest Avenue, the stairs to the beach and the beach itself. Liberty Avenue, as shown on the plans, is thirty feet wide, and the foot path which the defendants follow is located approximately five feet southerly of the snow fence on lot 7 on Plan No. 27333A. Liberty Avenue itself is only a paper street. It is clear that the plaintiffs, as owners of lots 19 and 20 on the Higgins Plan have the right to use Liberty Avenue, in common with the owners of all the lots on the Higgins Plan and, as decided above, on the Lynch Plan. The plaintiffs have not used this right, but they ask the Court to restrain others from passing over the way on foot even though the owners of the fee of this portion of Liberty Avenue have no objection; it is well settled, of course, that the owner of the fee which is subject to an easement retains all rights therein not inconsistent with the grant of the easement. Healey v. Smith Carriage Co., 265 Mass. 203 (1928). Western Mass. Electric Co. v. Sambo's of Mass., Inc., 8 Mass. App. Ct. 815 (1979). A second and related principle is that the usual easement is not exclusive. Under all the circumstances here, i.e., the implementation of the Newton stipulation, the Lynch plan, the undeveloped nature of the surroundings and of Liberty Avenue and the type of passage over it, I find and rule that the defendants who own lots on the Smith Plan and DeMale may continue to pass to and from the beach on foot over the northerly half of Liberty Avenue. Greene v. Canny, 137 Mass. 64 (1884) is distinguishable. It follows that the private defendants' motions for summary judgment is allowed. [Note 1] Mass. App. Ct. Adv. Sh. (1981) 959.